San Carlos | Cummings Moving Co.
QUAINT FACT Harlick Skating Boots was founded and continues to this day in San Carlos. Throughout the years, famous roller skaters and ice skaters (Kristi Yamaguchi, Tara Lapinski, Tod Eldridge and Tai Babilonia & Randy Gardner) have proudly worn Harlick boots atop their wheels and blades. Oh, and Saturday Night Live alum Dana Carvey, yes, he is from San Carlos. WEATHER & CLIMATE Temps in San Carlos top the charts at in the mid-low 80’s in July and dip into the 40’s in January. San Carlos is considered to have a Mediterranean climate with dry summers with just enough rain to keep the grasslands, forest and shrub-lands happy. If you want to get out and enjoy the sunshine – June to mid October are the warmest months. VISIT SAN CARLOS There are so many wonderful restaurants downtown San Carlos. If you have a taste for it, you will likely find it here – they are known for their purveyors of great food of every kind. Pop in on the train and step off into the old fashioned downtown. Visit for the amazing parks, Farmer’s Market each Thursday 4pm-8pm May through September and the Art and Win Festival on Columbus Day weekend (2nd weekend in October). 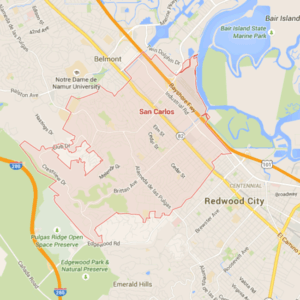 If you are remodeling your home, you definitely want to visit San Carlos! They are creating a new design district to showcase the largest selection of home improvement businesses in the area. LIVE IN SAN CARLOS Family, family, family! San Carlos is such a wonderful community – one of the best on the peninsula if they do say so themselves. According to locals, kids can safely stroll downtown for a frozen yogurt after school and everyone seems to know their neighbors in this six square mile city. Soccer and baseball teams abound, there are first-rate schools, plenty of folks with strollers, a big community library, historical museum and delightful summer concerts in Burton Park. OUTDOORS Enjoy time outside with the family or take visitors up in the air for a grand view of the bay. Burton Park – Family-friendly fun in the water, sun or shade. INDOORS This city seems to have four great loves – family, food, wine and flight! On that very rare day, when you need a break from the heat or rain, try these. While a couple are kid-friendly, the others would be a nice get-away for parents and their friends.